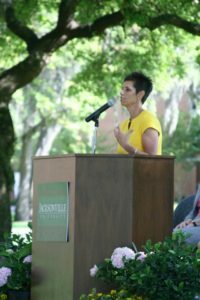 Dr. Christine Sapienza, Dean of Jacksonville University’s Brooks Rehabilitation College of Healthcare Sciences, is already known worldwide for her clinical trials on airway protection, mentoring thousands of students and clinicians, initiating community outreach on voice and respiratory rehabilitation and producing innovative research in speech-language pathology. She now has another distinction: She is a Jacksonville Business Journal 2016 Woman of Influence, and will receive the award at a banquet on Wednesday, Aug. 24, at the Renaissance World Golf Village Resort in St. Augustine. The award recognizes women who have helped shape Jacksonville’s business community and the region overall by their involvement in businesses, nonprofits and the public sector. Out of a record number of nominees this year, 25 were selected through their work, words and accomplishments as inspirational leaders for the First Coast. Dr. Christine Sapienza speaks at the groundbreaking for the new health sciences building. Sapienza has developed particular expertise in implementing larger-scale randomized clinical trials examining airway protection treatments. Sapienza is also author of the best-selling graduate textbook Titled “Voice Disorders” (Plural Publishing), which will be released in its third edition soon. She has produced multiple multimedia tools for voice therapy and published a “How To” book on respiratory muscle strength training. Sapienza has published more than 115 peer-reviewed papers, as well as numerous book chapters. Sapienza worked closely with Jacksonville University President Tim Cost, the faculty in her college and outstanding staff to create health sciences programs that address market demands, and has raised the standing of the University and BRCHS in the region. Through her vision, the Brooks Rehabilitation College of Healthcare Sciences represents a cohesive brand that includes the School of Nursing, School of Applied Health Sciences and School of Orthodontics. Since Sapienza’s arrival in 2013, the College faculty have launched a Bachelor of Science in Communication Sciences and Disorders; and graduate programs in Health Informatics, Clinical Mental Health Counseling, Kinesiology, Speech-Language Pathology (SLP), Nursing Psychiatric-Mental Health Nurse Practitioner Cognate, Nursing Informatics Cognate and Nursing Adult-Gerontology Acute Care Nurse Practitioner (anticipated start fall 2016, pending approval). A BSN to DNP with cognates in Family Nurse Practitioner or Leadership, online RN-MSN and Master of Science in Dentistry with a specialization in Orthodontics (pending approval) have also begun. An Occupational Therapy Doctorate is in development. Sapienza was the primary developer of the MS-SLP, which has thrived since its inception in 2014. In the first year, there were more than 130 qualified applicants for 30 slots. The following year, 294 students applied, and this year, nearly 400 students are competing to be admitted. Overall, to date, enrollment in the School of Applied Health Sciences has grown by 150 graduate students. Dr. Christine Sapienza, Dean BRCHS, Speech Pathology professors, Drs. 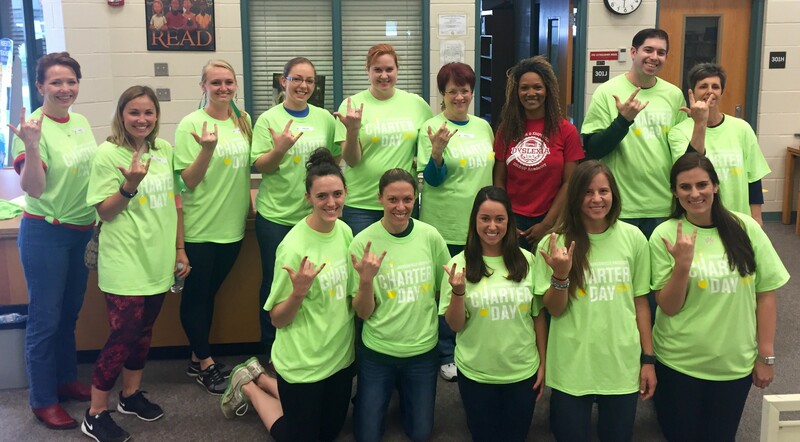 Judy Wingate, Raul Prezas, Robin Edge and MS SLP students volunteer at GRASP Academy during JU Charter Day 2016. Under her leadership, the College has created dedicated, reconfigurable and multipurpose learning environments; fostered wide use of the state-of-the-art Simulation Training and Applied Research (STAR) Center with 14 beds of newborn-to-adult patient mannequins; and created an Advanced Speech Pathology Lab and Biomechanics Lab. Over the past two years, Sapienza and her faculty have submitted grant applications for $1.7 million and brought in awards close to $750,000. Examples from 2015-16 include Sapienza’s grant to develop online patient and caregiver interactive guides for airway protection in Parkinson’s disease; a contract from Jacksonville Sports Medicine Program to establish the new Master of Science in Kinesiology (KIN) Program and Athletic Trainer Assistantship Program, with the new MS KIN program starting fall 2016; and a multi-year contract with Baptist Health Systems to establish a JU/BHS Nursing Residency Program for new graduate nurses. 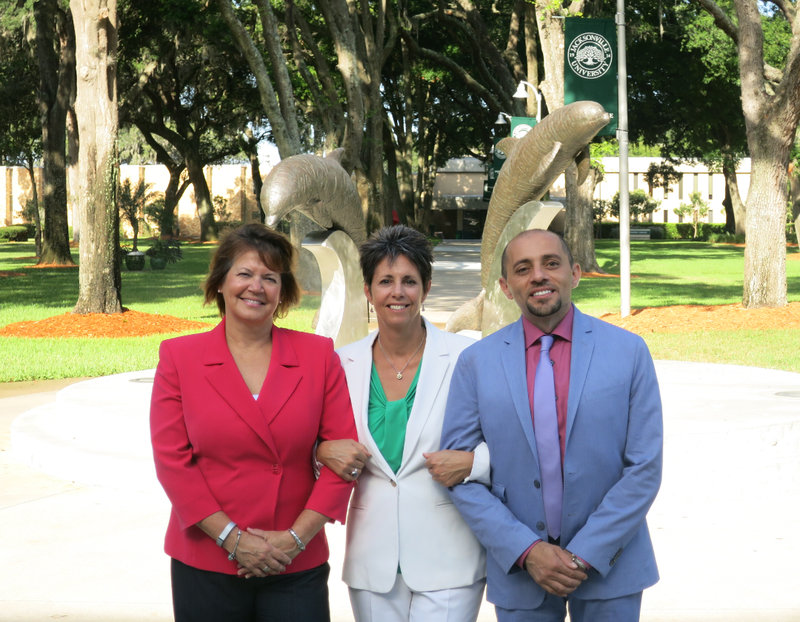 Brooks Rehabilitation College of Healthcare Sciences Dean Dr. Christine Sapienza (center) with School of Nursing Associate Dean Dr. Cheryl Bergman and School of Orthodontics Associate Dean Dr. Mark Alarbi. 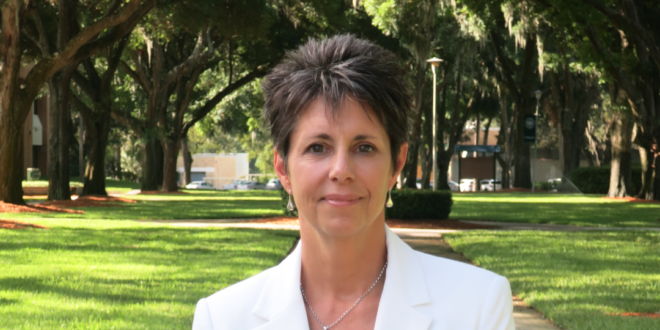 Previously, Sapienza was a longstanding tenured professor and Chair of the Department of Communication Sciences and Disorders at the University of Florida, and helped it become a top nationally renowned department in the UF Health Science Center. She also was a Research Career Scientist at the Brain Rehabilitation Research Center at the Malcom Randall Veteran’s Administration Hospital in Gainesville. Her research has been funded by the National Institutes of Health, the Veterans Affairs Rehabilitation RR&D Service, the Michael J. Fox Foundation and the non-profit CurePSP. “In my role at JU, my goal is to work with others to lead and create change now and in the future for our University, thinking big as JU/BRCHS leads the way as a front-runner for health care education,” Sapienza said. As a frequent contributor to patient support groups and nonprofit organizations, she aspires to assist patients and caregivers as they navigate available treatments and emerging science. Sapienza is a caring practitioner. She is an accessible, empathetic and accomplished speech-language pathologist and teacher. Most importantly, Sapienza is a proud mother to two adult children – Frank and Kim Sapienza – who are successful and happy in their careers and lives.